In the current era of complete genome sequencing, Bioinformatics and Molecular Evolution provides an up-to-date and comprehensive introduction to bioinformatics in the context of evolutionary biology. is accompanied by a dedicated website - www.blackwellpublishing.com/higgs - containing downloadable sequences, links to web resources, answers to self-test questions, and all artwork in downloadable format (artwork also available to instructors on CD-ROM). 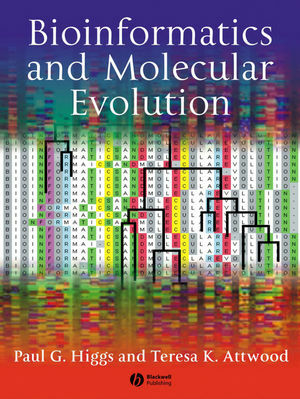 This important textbook will equip readers with a thorough understanding of the quantitative methods used in the analysis of molecular evolution, and will be essential reading for advanced undergraduates, graduates, and researchers in molecular biology, genetics, genomics, computational biology, and bioinformatics courses. Paul Higgs is currently the Canada Research Chair in Biophysics at McMaster University. Previously, he was the course director of the Bioinformatics MSc at Manchester University. He has a PhD in statistical physics from the University of Cambridge. His current research interests include RNA structure and sequence evolution, molecular phylogenetics, theoretical evolutionary biology, and population genetics. Teresa Attwood is Professor of Bioinformatics at Manchester University, Visiting Fellow at the European Bioinformatics Institute, and author of the PRINTS protein fingerprint database. She has a PhD in biophysics from the University of Leeds, and now teaches national and international courses in bioinformatics. Her current research interests include protein sequence analysis, data visualization, and biomedical text mining. Chapter 1. Introduction: The Revolution in Biological Information. Chapter 2. Nucleic Acids, Proteins, and Amino Acids. Chapter 3. Molecular Evolution and Population Genetics. Chapter 4. Models of Sequence Evolution. Chapter 5. Information Resources for Genes and Proteins. Chapter 6. Sequence Alignment Algorithms. Chapter 7. Searching Sequence Databases. Chapter 9. Patterns in Protein Families. Chapter 10. Probabilistic Methods and Machine Learning. Chapter 11. Further Topics in Molecular Evolution and Phylogenetics. Chapter 13. DNA Microarrays and the 'omes. This PDF file and the others below require Adobe Reader to view. If your computer is unable to view Adobe PDF files, you can download the free reader from Adobe. The artwork files for this chapter and the others below are stored in ZIP archives. If your computer is not capable of opening ZIP archives, you can download a free trial of Winzip. This Word document requires Microsoft Word to view. If your computer is unable to view Word documents, you can download the free reader from Microsoft.